Duration: 3 min. per epi. 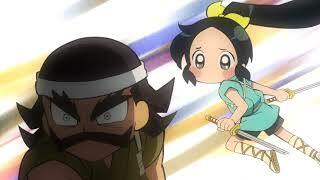 Nobunaga's beloved sister Ichi has married Azai Nagamasa. But the impending battle between the Azai + Asakura forces and the Oda Army is unavoidable. Even a moment's hesitation could cause either side to lose something important at the Battle of Anegawa. It is there that Chidori, who has been saving her tears, will awaken. In this battle to bring the whole country together, there are times where even brothers must fight!